It can be very challenging for college students to find the time to job search during the semester. After all, they are busy with academics, athletics, co-curricular activities, volunteer work, internships, and a busy campus social life. In addition, for students who want to work summer or post-graduate jobs in locations far from their campuses, it is hard to travel to these places to network and/or interview during a busy semester. Therefore, the semester break can be an ideal time to ramp up the job search. Students are not busy taking classes during this time, so they have a chance to take the steps needed to land a good summer or post-grad job. So, what can students (often with the help of families) do to capitalize on this window of opportunity? Here are ten tips for how best to job search during the semester break. It can be fun to think about where you'd like to spend your summer or start your career. Once you have a location of interest, search for job openings in that location and apply to as many opportunities as possible. If the location is far from your school, let employers know that you are available during break for an interview or even an informal meeting (if they are not yet conducting formal interviews). This strategy will be particularly important if you will be abroad during the semester and not available to meet with employers during that time. Since many jobs will not yet be advertised, it is equally important to identify employers in fields of interest even if you haven't seen any job advertisements from them. You can use local chambers of commerce and employer directories as well as a variety of other resources to research companies in your field. Once you find companies you are interested in, send a letter of interest and resume or even visit some local organizations and inquire about summer or entry-level opportunities. Traveling to check out new locations can be exciting. Think about family and friends in those areas who might allow you to stay with them for a couple of days while you conduct your meetings. Semester break is an ideal time to reach out to contacts in locations, fields, and organizations of interest. Use informational interviews to ask them for advice about your search, information about their field, and suggestions about jobs and internships. These meetings can often lead to job referrals and are a critical piece of any summer or entry-level job search. Ask your college career and/or alumni office for a list of contacts in fields and geographic areas of interest. Parents can help by pulling together a list of family contacts to approach for informational interviews. Send a letter via email or old-fashioned snail mail to these people telling them a little about what you are up to in your life and include a request for an informational consult or referrals to any of their contacts in areas of interest. If the letter is to a family contact, include a current photo – old folks love to see how you've grown! 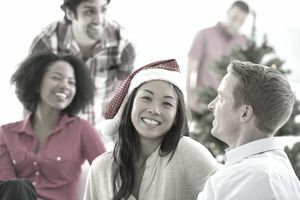 Take advantage of any holiday gatherings to talk about your situation and ask for advice and referrals. You will be amazed at how helpful these family "friendlies" can be with your job search! If you identify any people eager to help, consider asking them if you could shadow them or a colleague over break. A shadow experience will give you great insight into the field and the opportunity to meet and make a favorable impression with lots of people on the inside of that organization. Check to see if there are any job fairs in your area over break and attend if possible. Ask your college career office as well as local chambers of commerce for suggestions for local or popular fairs. Use the break to create or update a LinkedIn profile, search for a networking group for your college, and/or ask your career or alumni office for suggestions. Identify industry groups for fields of interest and join them if they are open to students. Reach out to people in these groups and ask if you might meet with them for an informational consultation to learn more about their field. Identify employers who will be visiting your campus to recruit this upcoming spring, then compose drafts of cover letters and revise your resume in anticipation of their visit. Professionals in your college's career services office will often be available during break to critique your letters from a distance. If you spend a couple of hours each day over break carrying out these types of activities, you will still have time to decompress. You'll also relieve some of the pressure of the upcoming spring job search.